CONSTRAINED_RESIZE_POLICY tells JavaFX to have the TableColumns in a TableView take up remaining horizontal space. But if you want only the last column to assume the extra space while allowing other TableColumns to be resized manually, you'll have to do something else. By default, a JavaFX TableView has a column policy of UNCONSTRAINED_RESIZE_POLICY. This means that the TableView will rely on the explicit specifications of the TableColumns. This screenshot shows 3 columns each with different preferredWidth properties: 50, 100, and 100, respectively. Notice the extra space after the Data TableColumn to the right. The extra space can be captured by using a CONSTRAINED_RESIZE_POLICY. This screenshot shows this setting. Be aware that all of the TableColumns must be resizable for this to take effect. In the source, the TableColumns have different preferrredWidth settings, but the constrained setting forces them all to be the same width. 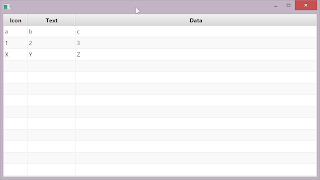 This program uses JavaFX binding to link the Preferred Width property of the last column to the available space as calculated by TABLE WIDTH - SUM(OTHER COLUMNS). The binding expression is. .subtract(2)  // a border stroke? tcIcon, tcText, and tcData are 3 columns. tcIcon is fixed. tcText and tcData are resizable. tcData is expected to acquire any available space when the screen is displayed or if the screen is resized. The result is a TableView that honors the preferredWidth settings for all but the last TableColumn. This class is followed with a definition of RowType which must be public so that the PropertyValueFactories will work. And this is the JavaBean for the TableView. This didn't work for me. I put the code in a stage.onShown() and tried a few resize policies. Note that the binding syntax also accounts for width changes to the overall window. You can probably also remove the Platform.runLater() since the iteration is likely already on the FX Thread. Hello! It worked for me! Thanks a lot! Greetings from Brazil. is there a way for the first and the last column be constraint and the middle column have a fix size? Sure. Replace the tcData expression with the following which will apply binding to the first and last columns. .subtract(1) // a border stroke? Found an easy solution that works with CONSTRAINED_RESIZE_POLICY : just set minWidth and maxWidth to the same value on components you do not want to expand. Jules that helped a lot. Thanks.